Adapted and reprinted from The Jag Mag (Feb/Mar 2011 issue), with permission from the author. I can't remember when I first became aware of the E-Type Jaguar except that it must have been sometime in early 1961, when newspaper articles and photos began to appear. On the other hand, I will never forget the first time I actually saw one in person. I saw my first E-Type one damp autumn night in the mid 1960s. At the time I was a just young man living in a tough fishing town in the North of England. I worked night shifts at a local chemical plant and I was on my way to work on my Lambretta. I had stopped at a traffic light, when a dark E-Type drew alongside. I looked at it and was stunned. 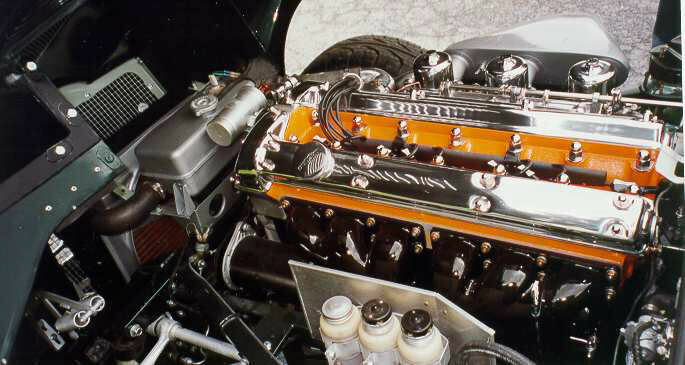 It was automotive love at first sight. I glanced at the driver; he looked at me with a bit of a smirk. I blipped my throttle; he tapped his accelerator. As we stood there waiting for the light to change, we both knew that we were going to have our own little drag race. The light turned amber and then green, and I was off - but wait, he was next to me one moment and then far ahead the next instant. I will never forget the sight of his taillights disappearing in the distance, nor the vapor from his exhaust hanging in the night air, that I would have to drive through. It was at that moment that I vowed that I would one day own an E-Type. 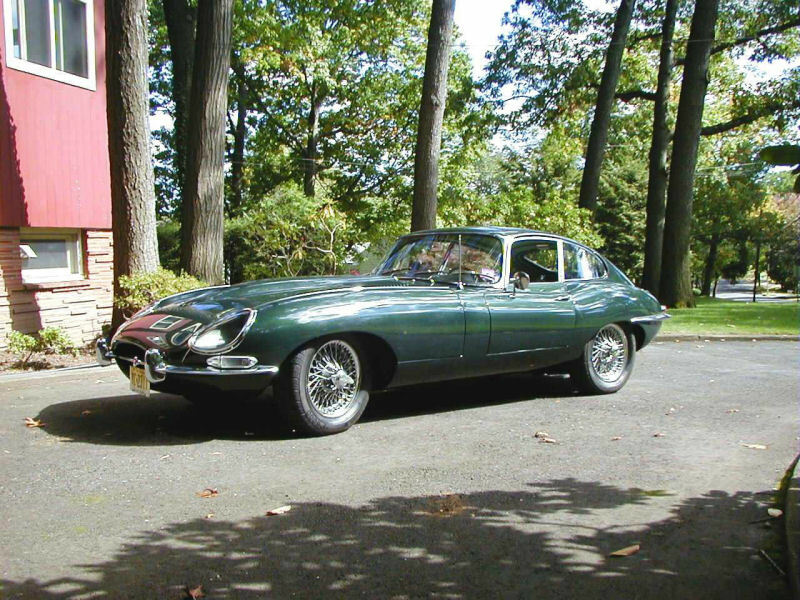 At the time, there was no conceivable way I could afford an E-Type. Ours was a poor town. I too was poor. So, I put it on the list of things to do "one day." Two or three years after the encounter with the E-Type, I was in the local public library and something of a miracle happened. By chance, I found myself in the mathematics section and was drawn to a little textbook with the title "Elementary Analysis". I started studying it on the nightshift that night and in all my spare time afterwards. I was hooked. This book was followed by a series of increasingly more advanced books. Within a year I had taken and passed the entrance exams for university and a few months later went up to read for an honours degree in mathematics. Everything was a blur after that; meeting Julia at university, our graduations, getting married, years of actuarial study, children, moving to America, a frenetic life as an international consulting actuary. And yet during all that time I never forgot that encounter with the E-Type. Every so often I would see one on the road, and would be reminded of that promise all those years ago. By the late 1990's I was beginning to think of retirement. Julia had said that I shouldn't retire unless I had a hobby. 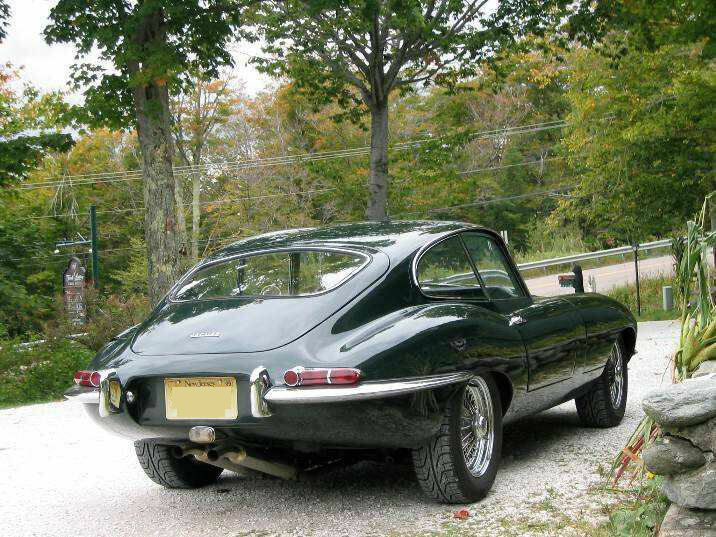 Then, quite by chance, I heard of an E-Type for sale. The niece of our then next-door neighbors was visiting. She popped her head over the garden fence one day and, quite out of the blue, asked me if I liked E-Type Jaguars! What a coincidence! She explained that she knew of one for sale in New York. It was owned by Gordon Parks whom she had known since her childhood because of her father who had produced the original "Shaft" movie in the early 1970s, which Gordon had directed. A few days later, Julia and I found ourselves at Gordon's east side apartment in New York. He chatted with us for over an hour about life and things in general. Gordon was familiar with the UK and was very curious as to how we had ended up living in America. He told us about his early childhood, growing up in Kansas, leaving home at an early age, and his early struggles against poverty and discrimination. He told us how he came to be a photographer in the 1930s. At the time he worked as a Pullman car attendant on the railways. A passenger had left a copy of a photographic magazine on a seat. As Gordon glanced through the magazine he was struck with an urge to take photographs. At the next main stop he bought a second hand camera, a roll of film and shot his first set of photos. Soon thereafter he was able to convince the wife of a department store owner to let him shoot some fashion photographs. One thing led to another, eventually leading him to fame as a photographer for Life Magazine, as a movie director, an author, poet and as a composer. Eventually Gordon said, "well, perhaps we should go look at the beast." We walked across the street to an underground garage where the car was stored under a tarp. It was a dark green coupe. The car looked quite grimy and in need of work, but there was no rust that I could see. Gordon asked to sit in the car one last time. As he sat there, with me in the passenger seat, he said that he didn't think he could part with it after all. He had owned this car for 37 years from new and it clearly had many wonderful memories for him. I told Gordon that it needed to be brought back to life and driven, that it was a shame to just let it sit there. I promised that I would restore his car to the way it looked when he first took delivery all those years ago and that I would treat it with care and love. It was on this basis that he agreed to sell the car to me. spin: first I drove it then he did; he was thrilled! I had planned to restore the car myself as a hobby when I retired in a year or two. But then a major client gave me a huge assignment that I knew would keep me busy for at least a year, and so I decided to have the restoration done professionally. 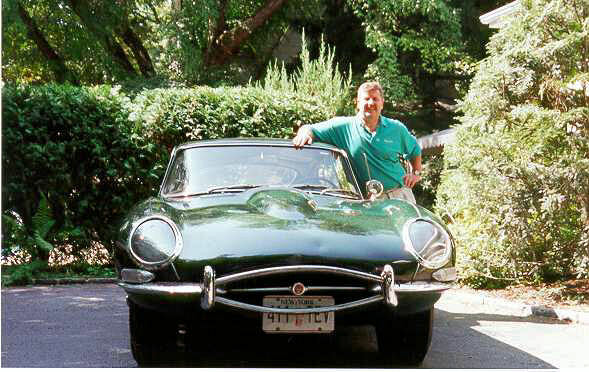 A friend had had his car (a "1-1/2" E-Type ) restored by a terrific Jaguar restoration shop out in Sinking Spring, Pennsylvania, and gave me an introduction to the owner, Terry Lippincott. So, a few weeks later I had the car flat-bedded out to Lippincott's Garage to begin the process of restoring Gordon's car to the way it looked when he first bought it all those years ago. I was very lucky to have found Terry to do the restoration work. He has been working on and restoring E-Types almost since they first came out. He knows them inside out. He immediately recognized the car as an early flat-floor, welded-louver model and told me that I had managed to snag a wonderful car. He and I agreed that he would give it a full frame-off restoration as a really nice driver to the original color and specs in the heritage certificate. The car would be opalescent dark green with a suede green interior. I had in mind a car that would look as if I had just bought it from new all those years ago -not one of those incredibly overly perfected trailer queens. I intended to drive this car! We decided to replace the Moss box, which I didn't like, with the later all-synchro gearbox; Terry also suggested upgrading the front brakes, which was done. Apart from this, the car is pretty much as it was when new. The car had barely over 40,000 miles years when I bought it and had almost no rust of any kind, so we were able to re-use all of the original parts. I took delivery of the restored car early the next year. It was everything that Terry promised it would be, and I am very happy indeed with the wonderful job he did in bringing the car back to life. Gordon never got to see his restored car. I knew that he was very busy working on a documentary for HBO about his life, and he had a new book coming out and so I thought it would be indelicate to bother him. He passed away in New York City in 2006 at the age of 93. Anderson Cooper, the television journalist, wrote a moving tribute to Gordon on his blog. He had known Gordon since childhood through his mother, Gloria Vanderbilt. He said that he loved it when Gordon visited, especially since Gordon would arrive in an incredibly beautiful sports car and had promised he would give it to him when he died. It seems Gordon had made the same promise to several other people who had fallen in love with his car! if he also used to look back at his life as he sat in the drivers seat and remembered his chance finding of that magazine and how it would change his life. I like to think that Gordon did, and that for him, as for me, the car was more than just a work of art or means of transport, but was also a symbol of how far he had traveled on the road of life.